The thrilling novella from author Kelly Gay in the expansive universe of the New York Times bestselling sci-fi/action video game series! Find. Claim. Profit. In a post-war galaxy littered with scrap, it’s the salvager’s motto. And with a fast ship and a lust for adventure, Rion Forge has certainly made her mark on the trade. When the discovery of a wrecked UNSC cruiser brings Rion’s past back to haunt her, stirring fresh hope into a decades-old wound, she’s hell-bent on finding answers: What really happened to her father and his ship, the Spirit of Fire? 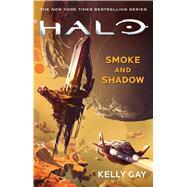 Featuring Gay’s signature “richly complex characters” and “fast-paced plot” (Publishers Weekly), Smoke and Shadow is an exhilarating page-turner for longtime and new fans of the Halo Universe. This novella also contains the complete text of Kelly Gay's short story, "Into the Fire," originally featured in the collection Halo: Fractures. Copyright © 2017 by Microsoft Corporation. All rights reserved. Microsoft, 343 Industries, the 343 Industries logo, Halo, and the Halo logo are trademarks of the Microsoft group of companies.